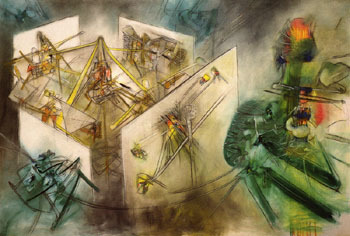 Spanish teachers looking for Spanish-language resources for Matta may visit the page Roberto Matta y el Surrealismo. Roberto Sebastián Antonio Matta Echaurren, a Surrealist painter of Latin American heritage, achieved what few artists from his region had accomplished before him, i.e., international status and recognition. Born and raised in Chile and educated by the Jesuits, Matta left his native country for Spain in his early twenties to explore his ancestral roots. Living an itinerant life in North and South America as well as Europe, Matta established connections with many renowned writers and artists of the twentieth century. Exhibited in major museums worldwide, Matta is usually presented as a "European" painter, based on his time spent in Italy and Paris. In February 2004, the McMullen Museum of Art will mount Matta: Making the Invisible Visible the first exhibition to critically focus on Mattas claim to having made the "invisible visible" and to make visible the Latin American influences that lend his work its distinct aesthetic. This retrospective will present approximately 30 major paintings, 25 of his finest drawings and four key sculptures, spanning the six decades of Mattas artistic production. The exhibition and accompanying scholarly catalogue explore the symbiotic relationship between important Spanish and Latin American literary figures and Matta, the artists visualization of psychological and religious themes, his unique position within the development of modern art, as well as the reception of his work. The catalogue of approximately 200 pages with all exhibited works reproduced in color, will comprise essays by four professors at Boston Collegeart historian Claude Cernuschi, literary scholars Elizabeth Goizueta and Sarah Beckjord, and theologian Roberto Goizuetaand the distinguished scholar of Latin American art, Mary Schneider Enriquez. The Unthinkable, 1957. Oil on canvas, 78 x 118 in. The exhibition will be installed chronologically, beginning with the artists well known European period in the late 1930s. This first section will highlight morphological works and will investigate how Matta grappled with the psyche and invented a visual language to evoke the subconscious. The second section focuses on Mattas time in New York City, demonstrating the artists shift from personal psychological "inscapes" to external landscapes. Also examined in this section is how Matta reorients his iconography in response to the horrors of World War II, by placing more emphasis on the figure. Drawings and paintings of his next creative phase, filled with humanoids and totemic beings, exemplify Mattas growing concern with the universal human condition rather than his own psyche. The exhibition will demonstrate how this "universalism" serves as a transition to the artists fourth period, the 1950s, in which he incorporates figures in a geometric and planar space. The last two sections of Making the Invisible Visible will exhibit fifteen works created during the last thirty-years of the artists lifea less studied and exhibited group. This section will critically explore the correlations between the artists pre- and post-war works and how they visualize his intense political beliefs, his ongoing fascination with the sciences, his dissatisfaction with the art market, and his revolutionary ideologies concerning the state of the world. Mattas paintings of the 1960s and 70s appear as swirling futuristic forms. His final creative period in the 1980s and 90s reveals an artist that has come full circle, placing a mystical spin on his concern for humanity.